This page is proposed by ISIFI Conseil. Settlement through Central Securities Depositories & Cash Settlement Centre. The market place is the place in which a market operates, and offer and demand meet. The following table highlights the main quotation places, as well as their managing institutions. GB The London Stock Exchange LSE The London Stock Exchange Group plc. DE Deutsche Börse Deutsche Börse Group. IT Borsa Italiana The London Stock Exchange Group plc. The Clearing process guarantees the consistent course of operations. Clearing houses set up a central counterpart system which legally substitutes the clearing house to the buyer and the seller in order to ensure the completeness of transactions. It is called “NOVATION”. Margin calls and deposits are the tools used so that to prevent default risk. Technically, it is impossible for a clearing house to go bankrupt. Where 100 buy-sell between two stakeholders would have created 100 transactions, a single but netted transaction is sent to the CSD. More than just ensuring the course of operations, the clearing house provide a final balance on a net basis between two (Bilateral clearing) or more (multiple clearing) participants. The settlement process secures the physical exchange of the securities versus cash, through the settlement of a securities transaction following an OTC (over the counter) trade. The settlement process may lead to cash settlement if the transaction was done ‘versus payment' (for this leg, a payment system intervenes). To decrease risks both legs have to be simultaneous and connate. Securities settlement systems may operate on a net basis, transactions are settled one by one and are considered irrevocable. On a net basis, several transactions are cleared before being globally settled. From a legal point of view, it is at this level that the transfer of property is finalised. The Central Securities Depository, in line with local custodians, acts as a notary; registering every single existing security and their related corporate actions. Doing so, they can make sure at any time that the number of issued shares booked on the issuer account corresponds to the total amount of shares owned by its participants. NB : Do not confuse Depository and Central Securities Depository. The Central Securities Depository registers the totality of the securities (shares & bonds) that are part of each issue accepted for its operations. In France , the CSD is know as Euroclear France (former Sicovam). The depository or custodian, is generally a bank and is a CSD adherent. A cash settlement centre is a technical platform that handles the settlement of high amounts between international finance companies. It is generally made up of a real time irrevocable & gross cash settlement system and a secured net one for multilateral clearing purposes. In order to facilitate, secure and enhance interbank exchanges within the euro Zone, the TARGET project was launched (1999). It consists in a Trans European Automated Real Time Gross Settlement Express Transfer, shared by each member of the European union, allowing cross border amounts to be transferred. Starting from the end of the 90's, the stock market's infrastructure consolidation accelerated without, taking into account the European frontiers and bringing stakeholders together through crossed participations. Until this point, market places and post market infrastructures (clearing & settlement systems) were state owned and user managed agencies. At the same period, a privatisation wave led to a disengagement of public institution. Gradually, regulation committees replaced the states in market supervision (AMF for France) and led to wild battles between private law companies, for the European race to catch market shares. 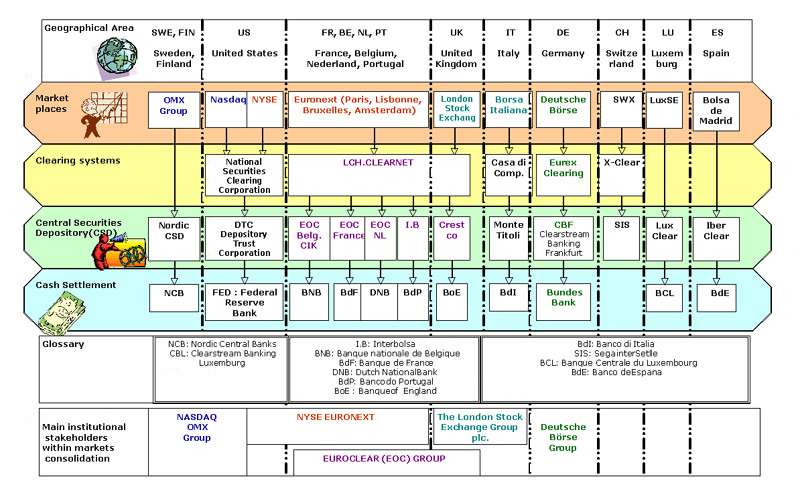 In 1999, the very first consolidation of clearing agencies took place; the pan-European extension of Clearnet (the central counterpart of the Euronext group) was preceded by the merge of two old clearing houses that used to intervene in the French stock market (SBF, Matif, BCC).To achieve cost cutting, several countries, where various settlement systems existed, decided to close in. That is what happened for Spain (CADE & SDL), Italy (CAT & Monte Titoli) as well as the UK (merge of CMO, CGO & Crest). At the level of settlement, the consolidation was organised around the two international central securities depository (ICSD) : Euroclear & CEDEL. In the late 2000's, the Belgian Euroclear Bank merged with the French CSD; Sicovam SA, to become a 100% Euroclear bank's subsidiary named Euroclear France. Meanwhile, the merger of the CEDEL bank (based in Luxemburg) and DBC, the german depository, gave birth to Clearstream. In September 2000, the Belgian and the Dutch stock market joined Euronext and brought a pan-European offer that encompassed multinational agencies that managed market's infrastructure. In 2001, the Deutsche Boerse, Euronext and the LSE headed to IPO (Initial Public Offering). A couple of months later, and against all odds, the Portuguese stock exchange and the Londonian derivative market joined Euronext. The DB, which owns the world leading derivative market (EUREX) is achieving its vertical stategy; called the ‘Silo' strategy (total control of the transaction chain); Trading, Clearing and Settlement, by buying Clearstream in 2002. After several failed attempts in merging with Euronext and the Deutsche Boerse, the LSE announced its successful take over on the Borsa Italia (the Italian exchange) in 2007. This consolidation trend is also reaching the united states through the NYSE-Euronext merger.